The generation of players now taking over the league has been exercising control in one way or another ever since they got here; now we are seeing how far they’re willing to go to grasp it at the highest levels—no matter how misguided the attempts may be. That’s the kicker of this article, bearing Justin Verrier’s byline but absolutely reeking of the heavy hand of his boss, titled “Anthony Davis Might Be Too Melo to Be the Star He Thinks He Is.” The pretense of this article is that it is a sober and evenhanded look at the damage Davis did to either his “legacy” or his “brand” when he requested a trade—which, again, is all he did—and thereby a high-minded examination of the perils of this allegedly newfangled era of empowered basketball superstars. Here it’s worth remembering that, as our own Tommy Craggs put it back in 2011, “a sportswriter talking about a legacy is just a fart talking about its own smell.” This gets at the actual business of Verrier’s article, which is not so much to examine the state of Davis’s “legacy”—an absurd exercise on its face, even relative to its stupid genre, given that he made his trade request less than two months ago and likely isn’t even halfway through his career yet—but to meekly participate in punishing him, here and now, for having attempted to exercise some self-determination over his career. According to Verrier, the trade request was an “insurrection,” with Davis grasping for control, for “spoils.” The apparent conclusion is that Davis is now at risk of becoming the next Carmelo Anthony, who himself is characterized here as something of a tragic, self-obsessed loser whose own reckless trade demand led him down a path with no lasting success either as a player or as a cultural figure. This is something of an odd conclusion to arrive at, given that the only parallel Verrier can find between Anthony and Davis—other than that both “entered the NBA riding the high of a decorated single season in college and achieved immediate individual success,” which broadly describes any number of other NBA stars—is that they both requested trades at some point in their careers. Is Kawhi Leonard, presently leading the Raptors to the No. 2 seed in the East after forcing his way out of San Antonio by taking nearly an entire season off, also at risk of becoming the next Carmelo Anthony? Underneath the impressive individual numbers in his 14 games post-insurrection you’ll find a net rating of just below zero—a tidy bit of symbolism for a player who is there but not present. More telling is that the Pelicans have been better when [Jrue] Holiday is on the court and Davis is not, which is a sharp reversal in the numbers that have paced the franchise since the 2016-17 season. Davis is clearly a brilliant player—the best New Orleans has ever had and perhaps ever will. But it’s no secret that the team has looked better without him of late; the only time the six-time All-Star took the floor during a thrilling 22-2 run to topple the Jazz in Utah two weeks ago was when the coaching staff rented out his long limbs to guard the inbounds pass on the final possession. Since his trade demand went public in late January, the Pelicans are 5-9 in games Davis “plays” and 4-5 in games he doesn’t. 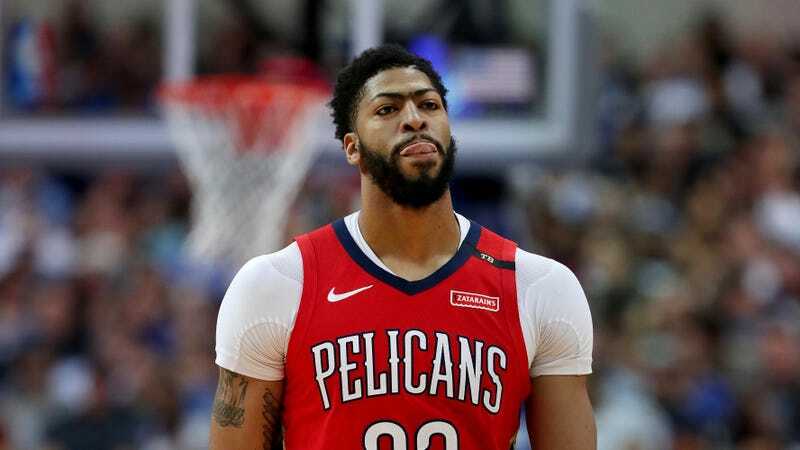 One last time, with feeling: All Anthony Davis did was request a trade, something professional athletes, famous and less-famous ones, have been doing for decades in all the major sports of the world. It was neither an unprecedented move nor even a particularly ambitious one. He asked the people who run the Pelicans to trade him, and told them where he’d like to go. All the rest—all the theorizing about a sinister conspiracy between Davis, Klutch Sports, Rich Paul, LeBron James, and Magic Johnson; all the tittering about palace coups and power grabs and the players taking over the league at the risk of their own legacies; all the underpinnings of Verrier’s mess of an argument; all of it—is an artifact of a media culture habituated to jacking itself off by pretending it can read the legacy-defining contours of every NBA story that bubbles up during the season. If The Ringer is looking for somebody to blame for those dismal conditions, the search can start closer to the office.